Have aliens been abducting Henry Denton since he was thirteen? Or has he been suffering from mental illness? Some days I believe the former; other days, the latter. But does it really matter? We Are the Ants is about much more than the end of the world (although those doomsday scenarios were highly entertaining). Shaun David Hutchinson uses science fiction elements to get at themes that are highly realistic: grief, guilt, love, nihilism… actually, this book is packed with ideas and Hutchinson weaves them through a story in which the protagonist is largely passive. Henry Denton is still grieving months his boyfriend committed suicide. This, plus his chaotic family life, dealing with bullies at school on a daily basis, and a closeted hookup who happens to be one of his tormenters, all lead Henry to believe that life is pointless. So if aliens give him a big red button that will save the world, he’d rather let the world end. All he has to do is wait until January 29, 2016 and nothing will matter for anyone. This is a character defined by passivity. Unlike his deceased boyfriend, Jesse, he’s not actively choosing to die; Henry simply doesn’t care to live. For most of the novel, things happen to him. Protagonists often have to take action to effect change and move their story forward. Henry’s character arc takes him from grief and an indifference to the fate of mankind, to love and wanting to make each day matter. This is one of the many things in this book I can’t stop thinking about. The central dilemma of the end of the world and Henry’s role in it looms over the story, allowing the subtle shift in his attitude. It happens with the help of people who love him and the passing of time. That’s how real life works for most of us. The cliché is “time heals all wounds,” right? Hutchinson shows that process happening and it feels dynamic and interesting because his voice is so clear and the characters are fully-formed. Henry’s voice is bleak yet funny, profane but sensitive, hopeful and afraid. Hutchinson skillfully brings all of these emotions into Henry’s voice, creating an authentic narrator who is simultaneously sympathetic and opaque. Occasionally the dialogue for and with other characters veers into cliché—scenes with Henry’s grandmother or mother are particularly prone to this—but overall Hutchinson’s command of voice is consistent and well-done. As Henry’s dreamboat, cinnamon roll of a friend/boyfriend, Diego’s dialogue is sometimes predictably perfect (and as a character he’s perhaps perfectly flawed as well). However, Diego’s tumultuous family history and descriptions of his artwork hint at a full life that exists just beyond the pages. Marcus, Audrey, and even Jesse are characters who seem like they could be the protagonist in their own novels. Hutchinson does just enough with the rest so that they’re not flat, but they stick to predictable beats. This isn’t a huge problem for the book though, because we see everyone through Henry’s eyes, and therefore they function like spokes on a wheel in which Henry’s the center. He asks almost all of the people in his life what they would do if they knew the world was going to end and they had the power to save it. Their answers are revealing—Henry’s mother shares his indifference, while Diego only wants Henry to want to save the world, and his brother’s girlfriend is concerned that he would even have to ask. “My counselor used to tell me that we remember the past, live in the present, and write the future. Even if the world ends next month or in a million years, we can still write our future Henry” (319). It’s ambiguous if Henry will get a chance to push the button to save the world before January 29, 2016. But given Henry’s new attitude and outlook does it really matter? Not at all. That open ending is exactly the point. There’s so much to discuss here. I didn’t even get to Henry’s grandmother, Alzheimer’s, and memory, or his emotionally and physically abusive relationship with Marcus. And the various doomsday scenes! Did you all catch the reference to another apocalyptically themed YA novel? If you couldn’t already tell, I think this one is worth serious Printz consideration, but what about you? *I recommended We Are the Ants for my school’s summer reading list and during the book circle discussion with students who read it, there was debate about whether his extra credit is, in fact, the entire book, or just the doomsday scenes and the framing sections. One student pointed out that all of those sections have the same triangular vector lines over the chapter titles. I’d be completely convinced by this argument if it weren’t for one line in the last chapter where Henry states that the paper has included, “a journal recounting the last 144 days of my life” (449). I think the student’s theory is sound though and I’d love to hear other thoughts about this. 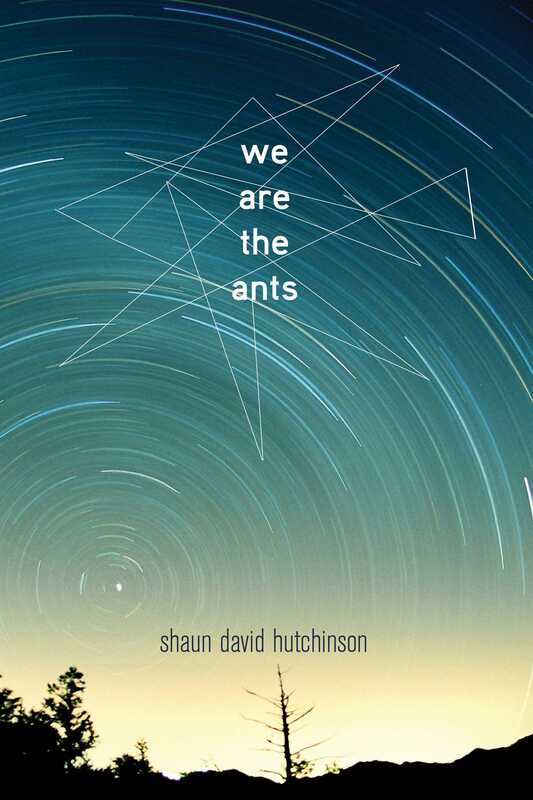 We just selected WE ARE THE ANTS for one of our Mock Printz selections and I honestly think it has a real shot at top prize, or at least an honor. There are lots of great LGBTQ books published this year (The Stonewall Committee has their work cut out for them) but this one is the best of all of them. This is my second favorite book of the year. I’m waiting to see if you guys review my favorite! I really liked this one in the beginning – the bitter humor, the end-of-the-world scenarios, the problematic secret relationship. But I felt like this novel lost a lot of its steam as it progressed. It went on for too long. After the first 1/4 I think it entered a very familiar, well-covered ground of grief, angst and self-destruction. Having an only barely sketched new love interest didn’t help either. In my eyes, We Are the Ants needed a little more tightening up and a little bit better developed secondary characters to be a real contender. This is one that has stuck with me, and that struck me as distinct from a whole lot of other stories with similar thematic scope (see: Federle, Tim, when we get around to that review). I think it riffs on the field — like with the GRASSHOPPER JUNGLE scenario — and tells an emotionally rich story. And while Diego is totally a manic pixie dream boy, who magically appears at the right moment (probably my biggest complaint with this one), I agree with Joy’s reading that it seems Diego has a lot more going on but Henry’s so consumed by grief/nihilism/depression/himself that he’s blind to everything, and so he parses Diego down to a tropey dreamboat — it’s a sign of the well done characterization of Henry, not the weak characterization of Diego. In short, I’d second this one for a nomination. I was thoroughly underwhelmed by this one. Diego’s Manic Pixie Dream Boy-ness did bug me; I recognize the plausibility of your reading, but it just felt stiff and false to me. Viviana and Zooey, too, came across as somewhat cardboard. And Zooey’s arc isn’t quite a classic woman-in-refrigerator–but it felt very much in that line, especially as it tied so directly to reproduction, her pseudo-superpower. (Those of us so equipped grow tiny humans inside our bodies. How is that not a superpower?) And I disagree on Henry; I thought his depression and grief were well-portrayed, but I thought he, as a character, fell fairly flat. Some of this may be my personal, emotional reaction to how sick I am of tragic queers, even when they get hopeful endings, but he felt like an embodiment of a stereotype more than a person. I also felt that the pacing was off–that it could have done as much, or more, with a hundred fewer pages. It moved smoothly in the middle, but I felt it dragged at both beginning and end.